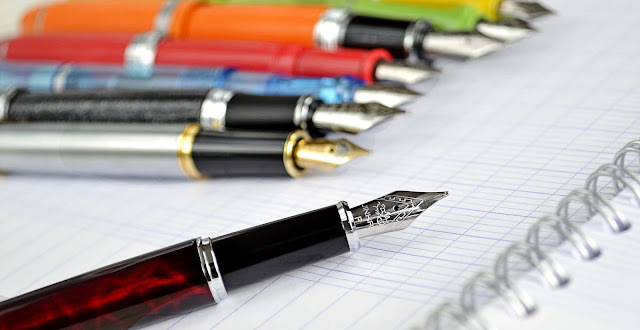 At iPenstore, we have over 100 fountain pens under $15, so choosing the top 5 wasn't easy. To narrow down our top 5 list, we surveyed customers and our staff, and combed through years of user reviews. We combined that information with sales numbers to come up with our list of the top 5 fountain pens currently available at iPenstore for under $15. Keep reading to check out our list, or click here if you would like to see our entire selection of fountain pens. We admit, lumping the pens manufactured entirely from one specific country into one category for a top 5 list may look like cheating, but let us explain. There are many brands of Chinese manufactured fountain pens. Here at iPenstore, we carry mainly the Jinhao, Baoer and Hero brands, so we're mostly referring to those in this case. The internal mechanism for these pens is basically all the same: a plastic twist-style converter (or standard international sized ink cartridge) sends ink down a plastic feed, and it's finished off with a stainless steel nib. From an "internal mechanism" point of view, most of these pens will write and perform exactly the same. Since the internal mechanism of the pens are all basically the same, it all comes down to the look and feel of each pen, and personal preferences vary widely when it comes to how a pen feels in your hand. Everyone on our survey listed at least one Chinese brand fountain pen on their list, but there was not a consensus on one pen in particular. Some like the thick, sturdy width of the Jinhao 159, but others love the thin barrel of the Baoer 801. Some like the heavy brass barrel of the Baoer 8 Horses, others like the feather-light weight of the Jinhao 992. On top of that, some mentioned that they love the classic look of the Hero 7032 or the Baoer 388 simply because they have the look of much more expensive pens, but they don't have to worry as much if they lose or drop them. Chinese brand fountain pens have historically been known throughout the fountain pen industry for being cheap, hard starters, or unreliable. However, more and more, they are gaining popularity for their ability to gracefully deliver ink to paper at an extremely affordable price. During our research, nearly every fountain pen user loved a particular Chinese fountain pen, but it was typically based on only the look and feel of the pen (not the performance). So, since there are so many choices in Chinese brand fountain pens, and the final decision will really come down to personal preference, we had to list them all as #5 on our list. The German-made Pelikan Twist is unlike any other fountain pen manufactured. The pen gets it's name from it's twisting triangular shape. The shape may look strange at first, but the elegant twist actually forms perfectly against your hand when writing. The soft-grip zone allows for relaxed writing and a comfortable grip. The amazing design and specially developed grip profile is suitable for right or left-handed writers. The Twist is available in 4 vibrant colors, with a contrasting color for the grip area. The unusual design, and energetic colors combine together superbly to complete this quirky, but fantastic fountain pen. The Pilot Kakuno fountain pen was designed by Pilot to be the best choice for a first fountain pen. The pen includes a simple user's guide to help you get started with a fountain pen. Pilot designed this pen to be fun and expressive by using rich colors, and amusing details. The nibs feature a smiling face on the medium nib, and a winking smile on the fine nib. The light-weight plastic barrel, snap-on cap, and reliable Japanese-manufactured stainless steel nib make this pen a joy for both kids and adults. The Rosetta Explorer is our top selling fountain pen for beginners. This pen has high quality features found on much more expensive pens. The iridium tipped, stainless steel nib and superb feeder system provide flawless ink flow and ultra-smooth writing. The barrel is made of a high-impact ABS resin, providing strength at a very light weight. A window in the barrel lets you see how much ink you have left - whether you're using an ink cartridge, or a converter (both included with this pen!). Finally, each pen includes a user's guide designed to introduce the fundamentals of using, and caring for a fountain pen. In the last 10 years at iPenstore, we have sold more Parker Vector fountain pens in the under $15 fountain pen category than any other pen - and it's not close. Some of that has to do with the fact that the Vector has been a great everyday pen for school or work since it first appeared in 1982. The pen was an instant success for Parker, and it continues to be an essential Parker product today. However, the most crucial reason the Vector has withstood the test of time: it's simply an excellent fountain pen. Parker has experimented with the design and materials in recent years, and even had them manufactured in China for a while. Now, with the newest version of the Vector, they've moved production back solely to France, and they've gone back to it's roots. The Vector has always been a thin barrel pen, typically made with a plastic barrel (although a stainless steel barrel is available for just a little bit more - and it's awesome). It's always featured a light weight, buttery-smooth steel nib, and very reliable ink flow. It also features a click-off cap that is light enough to not change the balance of the pen when posted. The new Parker Vector features 5 classic colors (black, blue, red, white, and stainless steel), and 2 new vibrant and trendy colors (turquoise and purple). The Parker Vector fountain pen is a favorite for both beginners and experienced users. During our research, one interesting comment about the Vector kept coming up, which solidified our ranking it as #1. When fountain pen users get a new pen, many of them ask themselves, "does this pen write as nicely as my Parker Vector?". What's your favorite under $15 fountain pen, and why do you like it? Is there a pen or brand that you wish iPenstore would carry? Send us an email at support@ipenstore.com, or let us know in the comments below! I first got a Pilot Vector around 1983, my first fountain pen. I have lots of pens I love - including a Vanishing Point - but the Vectors remain in frequent rotation. They're just good pens. Also, in the Chinese Pens, I really like the Deli brand (not sure if they're a subsidiary of one of the others). They are great starters. I like the looks of the hooded nibs and for the price, they're a good pen to carry and not worry too much about losing. Thanks for the comment, and for the suggestion on the Deli pens. We haven't tried that brand just yet, but some of them look really nice! We'll check with our suppliers to see what's available. Thanks! I love the Parker Vector. It was my first fountain pen many many years ago. I was in middle school and saw it in with all of the other pens while school supply shopping. I still have it and the other two Vectors. But it might be time to grab a new one in a in one of the new colors. Thanks for this list. A couple people were asking me what would be a great starter pen for a youngster. Just realized that it was probably a Vector that started my obsession with pens many years ago. Just a mention...."it's" is a contraction, not a possessive pronoun.